Trump gets in campaign mode in his 100-day speech in Pennsylvania. President Donald Trump speaks to supporters at the Pennsylvania Farm Show Complex & Expo Center on April 29, 2017 in Harrisburg, Pennsylvania. 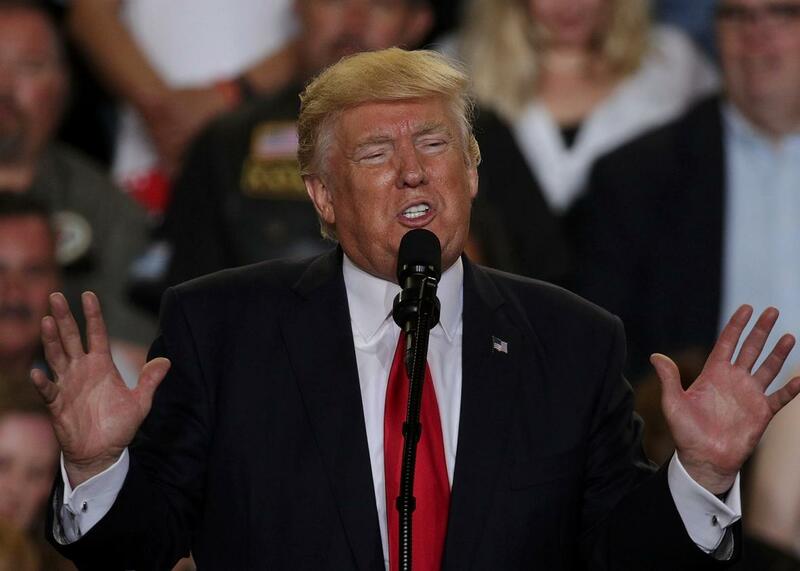 President Donald Trump marked his 100th day in office with a speech that sounded more like a campaign address filled with empty promises than one given by someone who has been sitting in the Oval Office for a couple of months. The address was everything we’ve come to expect from Donald Trump at this point, with lots of focus on him, lots of lies, and a parallel reality in which everything in his disastrous administration is just going peachy. There was even some evident lying about attendance, just like on Day One of his presidency. On Saturday, Trump insisted there were lots of people waiting outside to get in and he “broke the all-time record” in the arena, even though there were lots of empty seats in the arena. But, first, the president began by attacking the press for a long while, patting himself repeatedly on the back for not attending Saturday’s White House Correspondents’ Dinner. “A large group of Hollywood actors and Washington media are consoling each other in a hotel ballroom in our nation’s capital right now,” he said. “And I could not possibly be more thrilled to be more than 100 miles away from the Washington swamp, spending my evening with all of you and with a much, much larger crowd and much better people.” He, of course, failed to mention how he had been one of those Hollywood types who went to the dinner before he became president. Trump also specifically called out CNN and MSNBC as “fake news” but still said they’d rather be watching him than be at the dinner. He left the possibility open that he may attend the White House Correspondents’ Dinner next year, athough ever the consummate showman he decided to leave it as a cliffhanger. “Next year we’ll make it more exciting for them and show up, but we have a good chance of showing up here next year too,” he said. Trump then went on to cite polls that show how much Americans distrust the media without ever mentioning a single poll on his presidency. With that introduction, Trump made clear he still sees the media as his number one enemy, although he also reserved a few choice insults for Democrats, particularly Sen. Chuck Schumer. “He’s a poor leader and he’s leading the Democrats to doom,” Trump said. The commander in chief also acted as if he hadn’t suffered huge setbacks while in office, promising that the wall along the Mexican border will be built. And he vowed to “repeal and replace” Obamacare, continuing to promise that his new plan will include features that he must now by now are pretty much impossible. But that doesn’t matter of course. “We are all made by the same almighty God,” Trump said near the end of the speech. “We will not fail, we will never fail, we are Americans and the future belongs to us.” Yes, he had used that same line in his speech at CPAC, and yes, it is creepily reminiscent of a song sung by a young Nazi in Cabaret.